The Droid X works flawlessly with Gmail e-mail accounts. In fact, if Gmail is already set up to be your main e-mail address, you can access your Gmail messages all the time by using your Droid phone. You must set up regular e-mail, handled by the Email program, before you can use it on your Droid. After completing that quick and relatively painless setup, you can receive e-mail on your phone just like you can on a computer. Gmail: The New Gmail notification appears at the top of the touchscreen. Email: The New Email notification appears for other e-mail accounts you’ve set up. To deal with the new-message notification, drag down the notifications and choose the appropriate one. You’re taken right to your inbox to read the new message. To check your Gmail inbox: Start the Gmail app (which appears on the Applications Try). To get to the inbox screen when you’re reading a message, touch the Menu soft button and choose the command Back to Inbox. To check your Email inbox: Simply open the Email app. You’re taken to the inbox for your primary e-mail account. E-mail messages that appear on your Droid X aren’t deleted from the mail server. That way, you can read the same e-mail messages later, using a computer. Most computer e-mail programs, however, are configured to delete messages from the mail server. When they do, those messages may no longer show up on the Droid X. 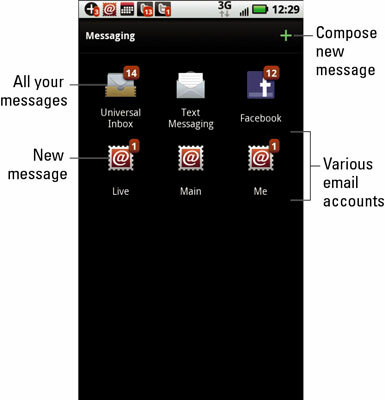 The Messaging app is the home plate for every account on your Droid X that receives messages. It includes your e-mail accounts, both Gmail and Email, as well as social networking sites and even text messaging. To view all your messages, open the Messaging app (in the Applications Tray). 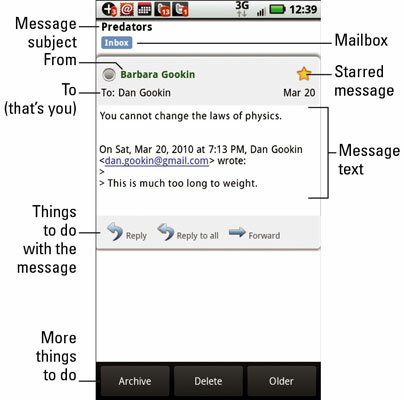 On the main screen that appears, you can find icons for all accounts on your Droid X, including mail, social networking, and text messaging. Your Gmail inbox is missing from the Messaging window. 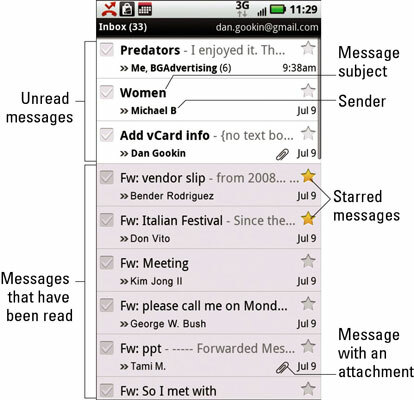 Gmail is its own program on the Droid X; your Gmail messages don’t show up in the universal inbox. This situation may change in future Droid X software updates. Select the New Email notification. Select a new e-mail by viewing the inbox. The message appears on the screen. Reading and working with the message operate much the same as in any e-mail program you’ve used. To read other messages in the inbox, touch the Older button. To read newer messages in the inbox, press the Menu soft button and choose the Newer command. In the Email or Messaging program, you browse the messages in your inbox by touching the up or down buttons, found at the bottom of the message window.